Thai Siam Queen – as gorgeous in the garden as it is delicious on the dinner plate! The sturdy stems support extra-large, 4-inch-long and 2-inch-wide bright green leaves. Clusters of short terminal racemes of purple flowers are borne on the very top of the plant for a highly ornamental effect. Thai Siam Queen is loaded with spicy flavor and aroma. Red Genovese – This Genovese-type basil, bred in England as an improvement over the popular Red Rubin, is as ornamental as it is delicious! You will smell Red Genovese before you see it, the huge, lightly cupped violet leaves releasing a spicy clove aroma. Fabulous for cooking or in fresh dishes, Red Genovese is a generous producer, with good branching on plants that reach 18 inches high and about a foot wide. Compact enough for containers, they stand out nicely wherever they are planted! Minimum – Minimum is full of pungent oils for a very strong flavor in one of the smallest of plants. This dwarf is perfect for ornamental use in edging or in containers. Pick the leaves and use fresh or dried in tomato dishes, pasta sauces, vegetables, and soups. You can also use it in the garden as a companion plant to repel aphids, mites, and tomato hornworms. Minimum grows only 6 to 12 inches high and wide. The tiny medium green leaves are only 1/2 inch long. Small terminal racemes of white flowers are borne in summer. Red Large Leaf Lettuce – O. b. purpurascens Basil wraps now have a bright, new look! Colossal, deep red, ruffled leaves have a deliciously vibrant flavor. Spoon some creamy parmesan polenta on a fresh leaf, wrap, and enjoy. Can also be used in any recipe calling for basil. Pistou – Pistou has the small leaves and dense, neat shape, but it is much more uniform, so a mass planting looks tidy and trim all season long! Pistou is a mild-flavored Basil, excellent for cooking and very fragrant in the summer garden. It forms a lovely circular plant that works perfectly in parterres and other formal settings, but is also right at home in the all-purpose herb garden, the annual bed, and accent settings of all types. Each of the 4′ square areas will have 3 varieties. The Thai and Corsican basils will be in the center. Then the two red basils will be planted around them. 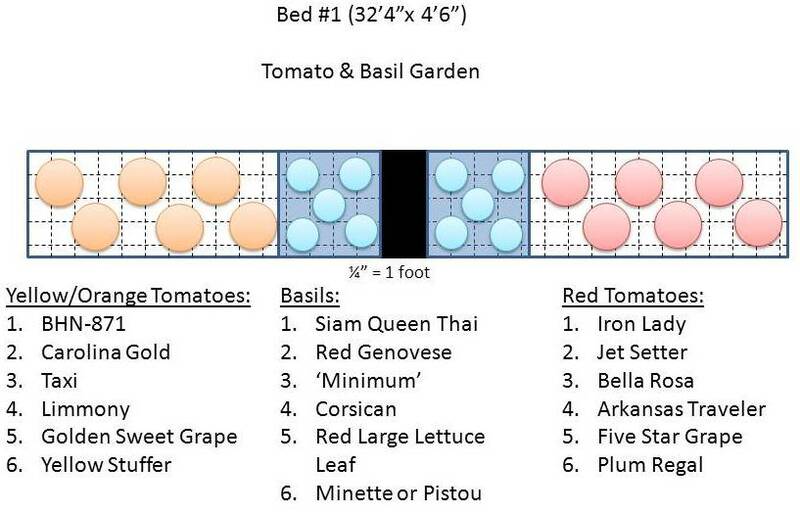 (Interestingly, we found 3 or 4 different catalogs advertising the “New” red Genovese basil, but each one had a different name for it. Same picture though…) Then the Minimum and Pistou basils will be along the edges. The ‘Minimum’ variety is supposed to have a more trailing habit, like thyme. That should be a different look for a basil!